Families have so many options when it comes to up-close encounters with the world’s most majestic creatures. Whether it’s horseback riding in Colorado or checking out the sea turtles in Nevis, here are 12 animal encounters your kids (and you) will never forget. The best part? All of these experiences aid in researching and protecting wildlife. 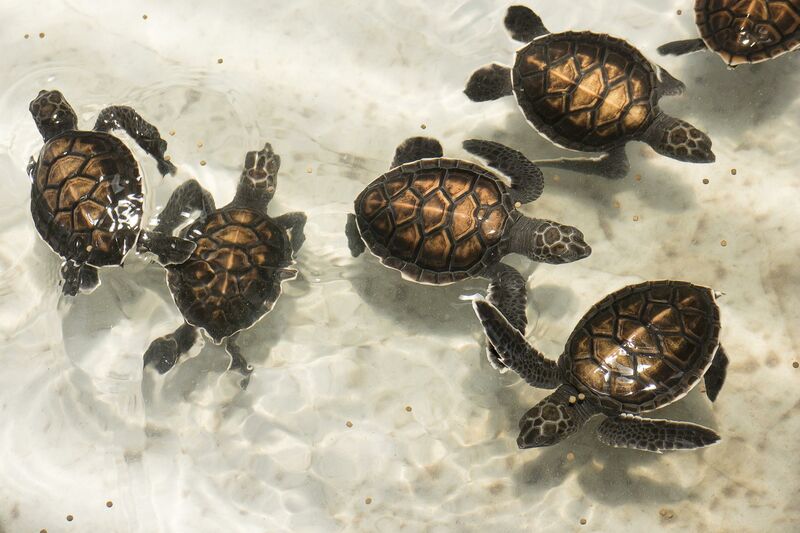 For an amazing, kid-friendly animal encounter, it’s hard to beat the beaches of Nevis, home to one of the most important sea turtle nesting sites in the Caribbean. From June to October each year, female sea turtles come back to the same place they were born to carry on the circle of life by laying hundreds of eggs. The Four Seasons Resort Nevis and the Sea Turtle Conservancy partner up each year in July to create awareness about the protection of these endangered creatures. Hotel guests, along with scientists, stay up late to comb the beach for female turtles making their way from the water to lay their eggs in the sand. Once a turtle is spotted (they weigh upwards of 300 pounds), everyone watches her dig a hole with her strong flippers and lay about 100 eggs (called a clutch). When she has thoroughly covered up her offspring, she’ll start to walk back to the water and that’s when the team of scientists moves in. They bring her back to the Four Seasons Resort Nevis for a night of luxury (she is bathed and has her barnacles removed). More importantly, she is affixed with a GPS transmitter and released back into the water. Many people go horseback riding for an hour or so on vacation, but that’s nothing compared to spending a week atop these majestic steeds. 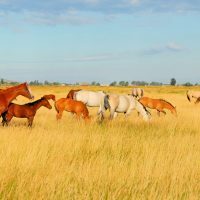 The setting is the heart of the Rocky Mountains in Grand County, Colorado, where four world-class dude ranches provide an all-inclusive, week-long experience. Each ranch has its own flavor and style. Bar Lazy J Ranch, the oldest continuously operating guest ranch in Colorado, has a truly Western horseback riding experience, as well as add-ons like trout fishing right on the property. C Lazy U Ranch is known for its rustic elegance and 5-Spur Service, both in the cabins and in its luxury spa. Drowsy Water Ranch has an amazing kids’ program for the junior cowboys and Latigo Ranch is secluded and intimate with the maximum number of guests at 35. Each day, families go out with experienced wranglers, starting with short practice rides and building up to full-day backcountry experiences. Plus, there’s plenty of activities in addition to horseback riding, including hiking, archery, rafting, lassoing, square dancing, hayrides, rodeos and rafting trips. You’ll be surprised at how quickly your family bonds while traversing some of the 600 miles of trails and roasting S’mores under a giant star-filled sky. 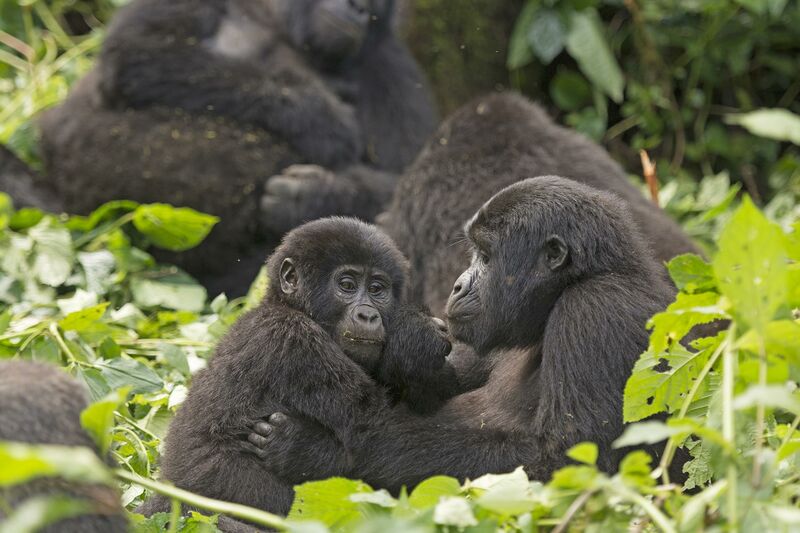 Uganda is one of only three countries in the world that has mountain gorillas. There are fewer than 900 in existence, making a sighting of these endangered species a bucket-list trip for many. There are two places within the country to trek to see them-Bwindi Impenetrable National Park and Mgahinga Gorilla National Park. Mgahinga has the largest number of adult silverback males, plus it’s lesser known than Bwindi, so a visit here means you’ll feel like you are getting the park to yourself and you’ll have some amazing interactions. Trekking can be anywhere from 30 minutes to two hours or more. Trackers are sent out ahead of time, so your group is not aimlessly wandering the park. Once the gorillas are spotted, you have 60 minutes to observe them at close range. You’re not allowed to get closer than 25 feet, but the primates, of course, can do what they want. Often, the younger juveniles will come close to visitors, as they are curious and playful. You’ll be surprised at just how human-like the mountain gorillas are — they share 98-percent of our DNA! Between snapping pictures and watching the gorillas interact, your allotted time will feel like it’s up quickly, but the memory will last a lifetime. Children must be 15 years old to participate. Chicago‘s world famous Shedd Aquarium lets kids (and adults) get up close to Magellanic penguins. The 60-minute encounter begins with swapping your street shoes for rubber boots (in case the birds gets curious about your feet). Then Magellanic penguins come waddling into the encounter room, where they walk around, play with toys, and eat fish while you stroke their silky backs and wings. You’ll learn all about the history, penguin anatomy, nesting season and penguin conservation work currently underway in South Africa. Ruka, a tree-filled ski resort in Eastern Lapland, Finland, is a magical winter wonderland where families can do reindeer and dog sledding during the day and see the Northern Lights at night. Ruka Safaris provides all the warm-weather gear-snow suits, gloves, boots, wool socks and ski/face masks — so families can focus on taking in the scenery as they ride through the wintery forests and over ice-covered lakes. 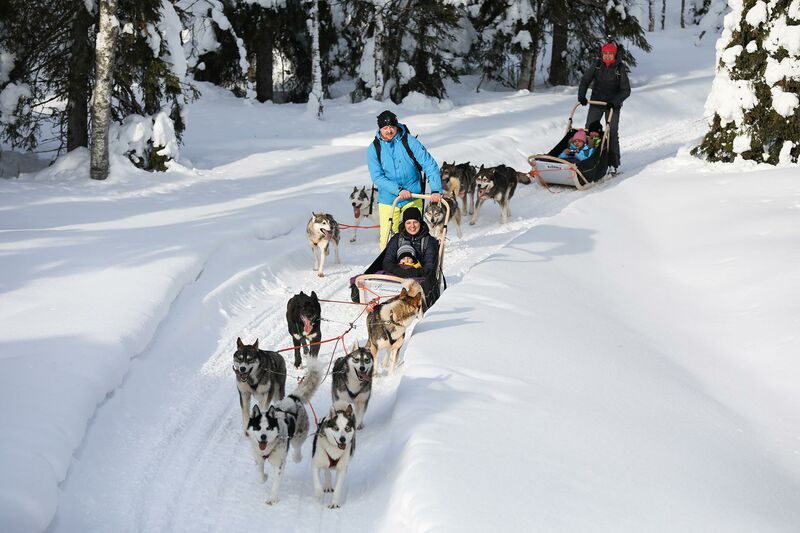 Don’t worry-these adorable husky dogs and reindeers know exactly what to do, but you will still learn how to “drive” the sled through the snowy forests. After you’re done sledding, you can fill up on hot beverages, pastries and local sausage. 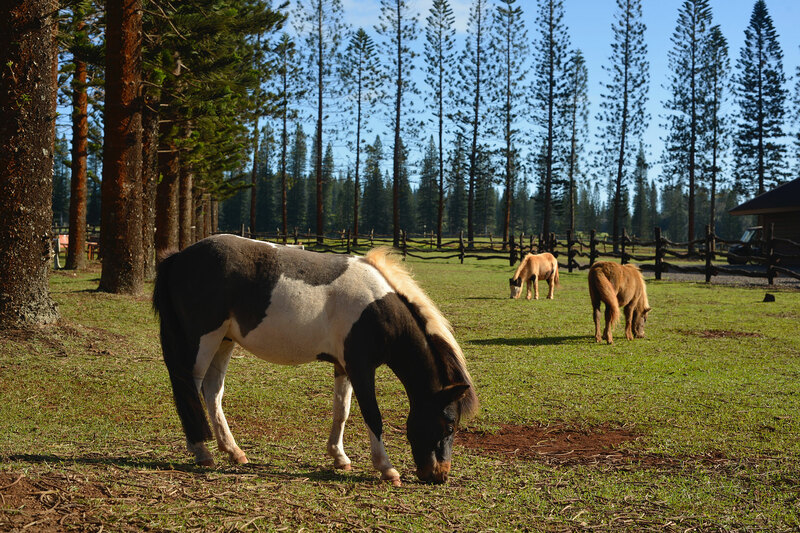 At the Four Seasons Lanai, kids can “Meet the Minis” — mini horses, that is. The Lanai Ranch at Koele, once the center of ranch operations on the island, has both miniature horses and donkeys. The kids will literally tower over these toy-size animals. Kids can pet and groom the minis while the wranglers talk about why these creatures are so small and how they came to live on Lanai. For even more fun, kids can go on a cart ride pulled by the minis. If that’s not enough, you can also see plenty of humpback whales from the shoreline from November to May, with the peak months being January to March. Families can feed and swim with hundreds of Cownose stingrays at Atlantis, Paradise Island Bahamas. Kids will love their smooth skin and friendly disposition. The trainers are really amazing so even if kids are slightly hesitant at first, the trainers can get them to open up and slowly make their way into the stingray world. Home to the largest open-air marine habitat in the world, Atlantis Resort has more than 50,000 marine animals and 250 species throughout its expansive property. 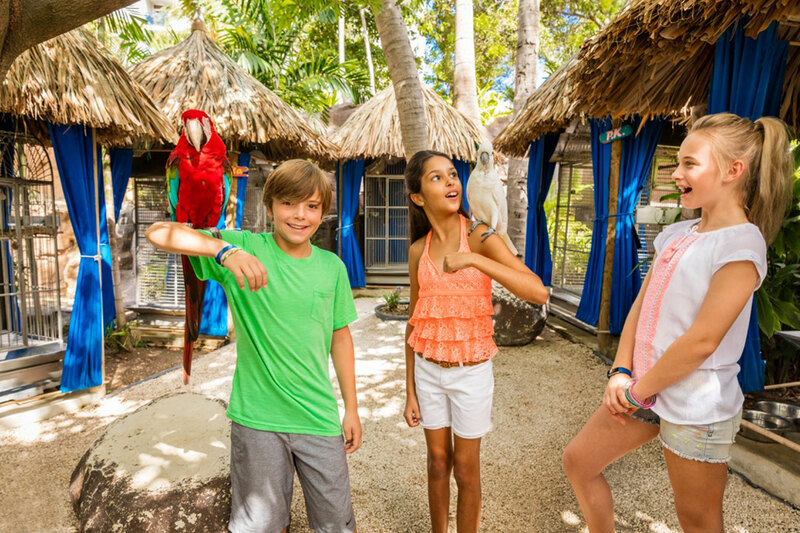 At the Hilton Aruba Caribbean Resort & Casino, kids can get up close and personal with the resort’s 11 feathered friends during the daily bird interaction session. 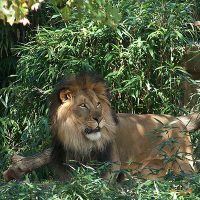 Kids will not only be able to interact with these pretty creatures, but they will also learn about their habitat and conservation efforts currently underway. You can even follow these feathered friends on their own Instagram! 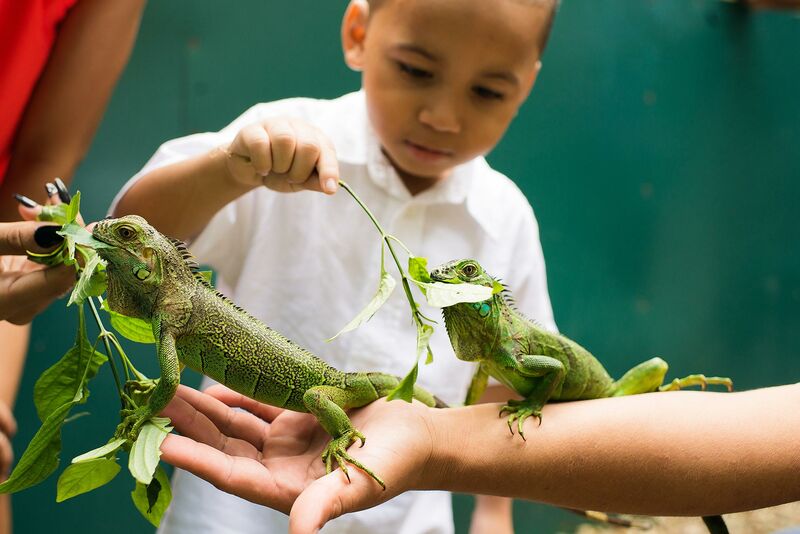 Located at the San Ignacio Resort Hotel, the Green Iguana Conservation Project is an interactive exhibit that gives visitors a closer look at the life of Green Iguanas. The venture aims to conserve and look after the endangered species by educating the public about the role Green Iguanas play in the ecosystem. Here, you can mingle with these wonderful reptiles and also learn about the incubation, hatching, rearing, and releasing process. Custer State Park in the beautiful Black Hills of western South Dakota is full of lush forests, quiet and serene meadows, and majestic mountains. 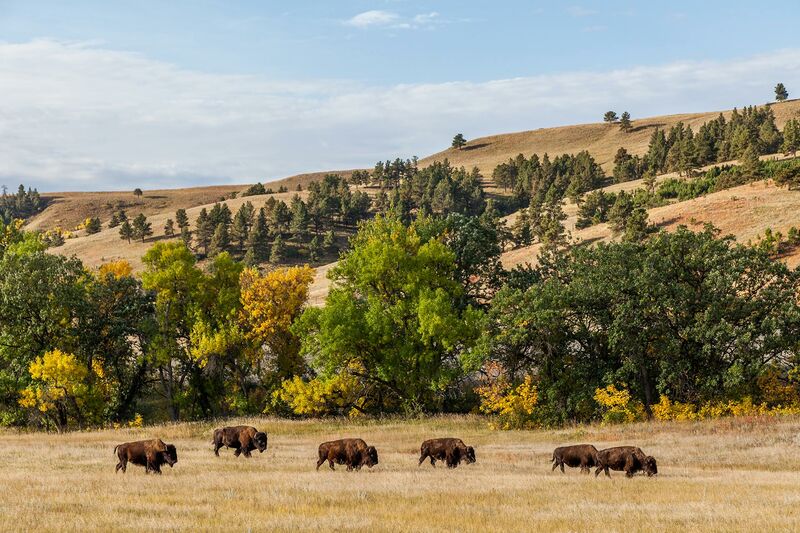 This 71,000-acre state park is also home to one of the world’s largest publicly-owned bison herds, nearly 1,300 strong. Starting in April, bison calves are born among the free-roaming bison and are easily recognized by their cinnamon color. Spring is the perfect time to see wildlife and their babies as the grass grows along the park’s roadways, attracting the animals into easy viewing distance. Every day, the naturalist guides from Delfin Amazon Cruise take guests on adventures skiffs (small boats) to discover the rainforest. 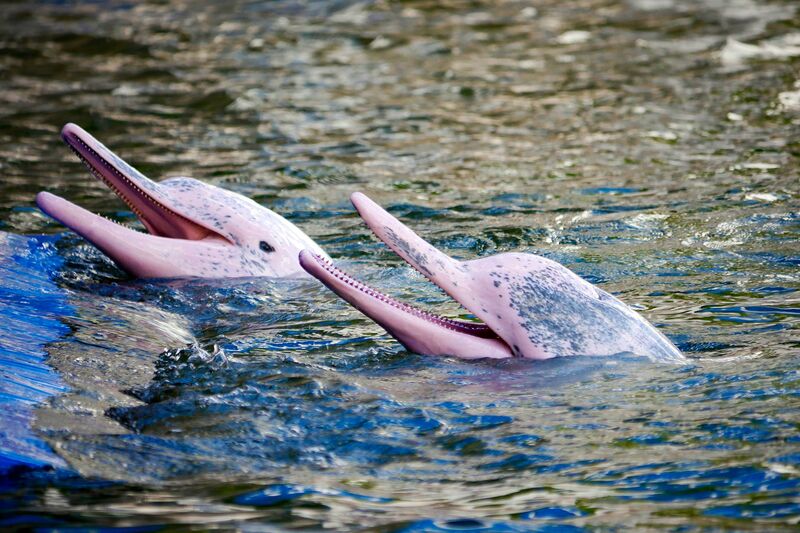 One of the Amazon’s key inhabitants to meet is the pink river dolphin, a rare species found in the freshwater rivers of the Amazon. These animals are social, friendly and extremely intelligent, much like their saltwater kin. You can jump in for a swim with these remarkable creatures. Delfin Amazon Cruises gives families an opportunity to get up close to the breathtaking wilderness setting of the Amazon Rainforest. In particular, the Delfin II is perfect for families thanks to its 14 large guest suites, four of which can be interconnected to accommodate large groups. Kids ages 7 and older can have an unforgettable experience deep in the Amazon rainforest on one of Delfin’s three- or four-night itineraries, which go into one of the world’s largest protected flooded forests, the Pacaya Samiria National Reserve. Experienced naturalist guides showcase the immense biodiversity of the area with excursions and activities that include (but are not limited to) swimming with pink river dolphins, fishing for piranhas, bird watching, rainforest hikes, night safaris and feeding manatees. 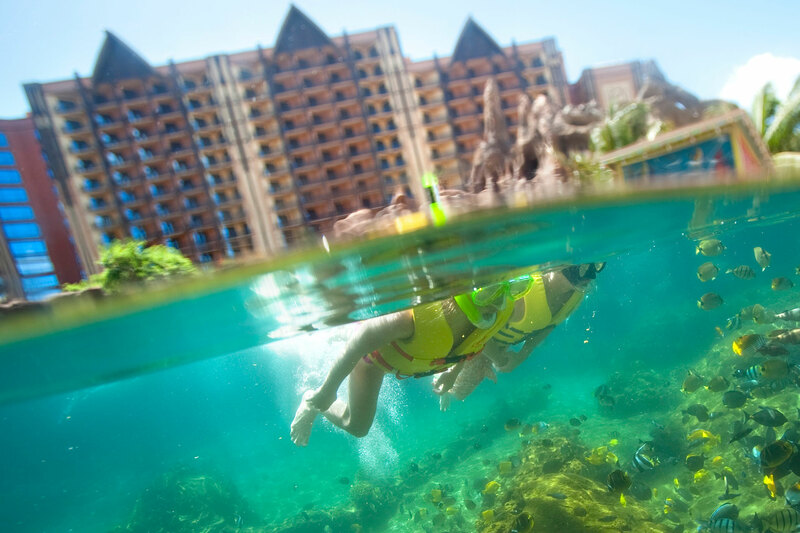 Rainbow Reef at Disney’s Aulani Resort is the only private snorkeling lagoon on Oahu and offers an up-close look at more than 1,300 brightly colored fish, including butterflyfish, angelfish, surgeonfish and tangs. This serene, man-made lagoon offers a safe, high-visibility environment where guests can snorkel without worrying about unpredictable waves and currents. 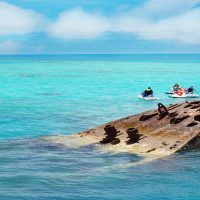 It’s an ideal excursion for beginners or those who prefer a calm and smooth snorkeling experience.